Rich culture and tradition of Thailand - GoodGuysBlog.com - New, Technology, Marketing, Health and So on. There is no denying that the Kingdom of Thailand has one of the richest culture and with vivid traditions on this planet. When a traveler finds their way through an exceptional kingdom, they observe specific cultures that are traditionally deep-rooted. It amazes them to the whole new level and if the people are friendly, they help them to integrate into their culture which is a new experience for everyone. The culture of Thailand is considered one of the most diverse and rich on this planet. The best thing about the people and culture is that they welcome others to practice it with them. With countries such as Cambodia, China, and India influencing it, along with multiple religions like Hinduism and Buddhism, it offers an exceptional blend of multiple cultures for everyone to enjoy. But the culture of this kingdom wasn’t formed in a days’ time. It evolved greatly over the course of this country’s past timeline, from ancient civilizations to modern era. Multiple civilizations and empires from all over Asia that ruled Thailand have influenced the culture which is observed there today. When you visit this beautiful piece of land, you may come across different cultural influences, such as Chinese and Indian that are still evident in Thai Traditions. From religious practices to food and attire, everything plays an important role in shaping the culture of Thailand. Even today, the modern culture has shaped itself with a healthy influence from western civilization. 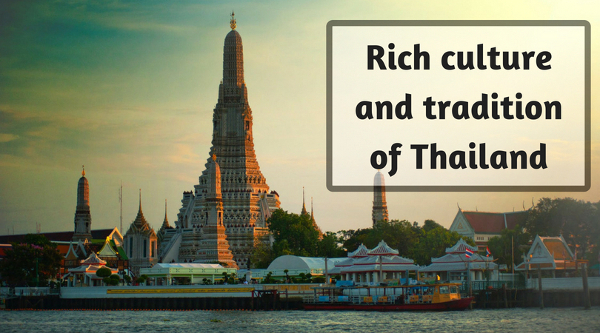 In this article post, we discuss the rich culture and traditions of Thailand. But before we begin with our research, we want to share one of the most important traveling tips with all our valued readers. Always book your tickets with an online travel agency. They help you to find cheap flights to Thailand. We want all the travelers to save and enjoy the most in their trips. Wai is a way of greeting each other in Thailand. The best thing a culture can teach you is to how you greet someone. If you really know this then you are always appreciated and welcome into any culture. Wai it is a common way to shake hands, but it is not only used to say just hello. It is also used to apologize to someone or simply say thank you. To do it, you need to bow with a two-hand gesture. It is certainly a unique and humble to greet others. You must learn it before visiting Thailand. The Thai language is made up of strong expressive emotions that are calm and patient. It is more like presenting a figurative heart rather than logic. People of Thailand love to smile and laugh. It makes them look more beautiful and simple. Being so simple and happy makes even a smile the best way to speak to each other. Although their local language is a bit difficult for a tourist to learn, with all the available gadgets it won’t be a problem. The key is to remain calm, polite and friendly, and the Thai people will always try to speak with you in any mutual language such as English, to solve your problem. Traveling can get you in different situations. It tests your patience and skill to resolve them. The best way you can use is to stay calm and collective. You need to keep your voice low and try to listen to others. It also builds trust and mutual respect, and in the land of smiles, it is everything you need to communicate. Visiting temples in Thailand is a must for everyone. Thailand is unique with its temples and every temple has its own practices, dress code, and other requirements. They are a sacred place and it is important to honor their sanctity and holiness. Before taking snaps, you must ask for the permission from the relevant authority. Thailand is a land of diversity. Their cuisine is different in taste from any other country on this planet and their manners of eating are also different. Commonly, Thai people prefer eating rice cuisines. Sharing is an important custom in their family life, so if you dine with a Thai family, always remember to share your food with others. People eat their food on the floor and eat their food by using their right hand. Although integration of western civilization has helped Thai people to adopt new ways and cuisines, they also follow much of their old traditions. The traditional Thai apparel is known as Chut Thai. It simply means Thai outfit. For women, it includes a blouse and a Sabai, or a pha nung and chong kraben. For men, it includes traditional pants, raj pattern shirt and Sabai. On important occasions, people wear formal Thai national costume. You should also try your hands on their local Thai clothing when visiting Thailand.